Sunderland midfielder Boudewijn Zenden believes Saturday's break for the FA Cup will benefit the players as they seek to end their winless run. Tuesday's 1-1 draw at Portsmouth extended the streak to 12 Premier League games and Zenden hopes the rest can restore some confidence. "Maybe it's a good moment to reflect on things," he told BBC Newcastle. "We can get our heads around it, and make sure we've got a fresh start towards the hard game at Arsenal." The Wearsiders recorded a number of impressive results earlier in the season, notably a draw against Manchester United at Old Trafford and a win against their next opponents Arsenal back in November - their last victory in the Premier League. And despite facing a string of tricky fixtures in the next two months, including trips to Arsenal, Aston Villa and Liverpool Zenden believes just one good result could bring Sunderland back on course. "It's bad if you look at the fact we haven't won for a while, that's obviously true but if we win then we get a bit of positivity into the camp and get a bit of confidence," Zenden said. "I won't call it negativity, because I think we're all quite positive in our minds, but we need confidence and that comes with results and scoring goals. "Any game gives you the opportunity to turn things round, and that's the good thing in football and home games seem to be slightly easier for us than being on our travels." 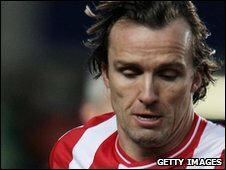 Dutch international Zenden, who has enjoyed spells with Chelsea, Liverpool and Middlesbrough as well as time in Europe with PSV, Barcelona and Marseille, has made more than 300 league appearances since his debut for PSV in the 1994-95 season.